.. and how to handle 4 common memory leaks. A good primer for anyone not familiar with the depths of memory management. babel-macros is a new Babel plugin for implementing zero-config, importable code transformations. V8’s latest branch is in beta until its release in Chrome 61 and it’s packed with developer-facing goodies including extra performance, more regex features, and an increased max string length. 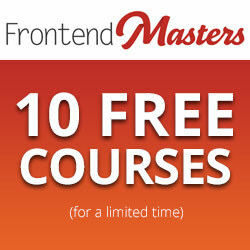 Get free access to upgrade your skills with in-depth and modern front-end engineering courses. Don't delay — these courses are only free until Tuesday. Are you an Angular dev looking to get started with React? If so, join Mark Brown for a guided tour of the differences and similarities. Node 8.5.0 was released this week. Starting with v8.5 Node can support ES modules natively. A gentle introduction to the foundational concepts. Slides and audio, but the post includes some written tips as well. Take a look at how Wijmo made FlexGrid accessible with ARIA standards and more. Where did things start and how did we get to where we are now? If you accidentally add a huge dependency, Size Limit will throw an error.